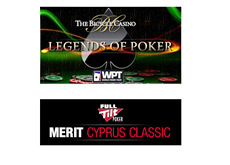 The final tables of both the WPT Legends of Poker and Full Tilt Poker Merit Cyprus Classic main event have now been set. Both final tables are set to take place on Wednesday. Andy Frankenberger will take the chip lead with him into the final table of the WPT Legends of Poker when play gets underway on Wednesday afternoon. Frankenberger managed to finish Day 4 with around 3.01 million in chips, which puts him slightly ahead of Tom Lee (2.9 million) and Kyle Wilson (2.8 million) heading into the final day of play on Wednesday. Jared Jaffee (1.0 million), Tom Braband, (968k) and Franco Brunetti (800k) also made the final table, but they will have plenty of work to do if they want to take down the event. Jonathan "FieryJustice" Little, who was gunning for his third career WPT title, ended up exiting the tournament in 12th place ($24,000). The final table of the Full Tilt Poker Merit Cyprus Classic main event has also been set, with Zsolt Vasvenszki taking the tournament chip lead with him into the final day of play on Wednesday afternoon (local time). All six players are guaranteed a minimum of $55,220 for making it to the final table, with the eventual winner of the event taking home $415,780. David Benyamine (12th), Kelly Kim (16th) and Eric Mizrachi (18th) were all eliminated from the event on Tuesday, with all three players taking home small cashes. David Benyamine also cashed in the High Roller Freeze-Out (4th place, $82,935) earlier in the week.